where they were mistaken ? Yes, They were mistaken at Extract or unzip the Oracle Software Files (1 & 2). They were unzipped separate folder not in one folder like linux enviornment , you can see after unzipped only one folder showing “database”. Windows , they were unzipped the two disk files using some Utility like Winzip or anyone. What happen here, It will unzipped separate folder, so When you’re going to install, some opf the components are missed out in this folder (First disk unzipped folder). What should we do? How do we unzip this Files? 10/17/2010 02:23 PM <DIR> . 10/17/2010 02:23 PM <DIR> ..
10/17/2010 02:25 PM <DIR> . 10/17/2010 02:25 PM <DIR> ..
After unzipped first disk files , I should go to unzip second disk files on same directory In this case , Some of the componets overwritten at “database” folder. 10/17/2010 02:26 PM <DIR> . 10/17/2010 02:26 PM <DIR> ..
Now I’m got Install , After Installation, the DBconsole also created succesfully. 04/03/2010 05:29 AM <DIR> . 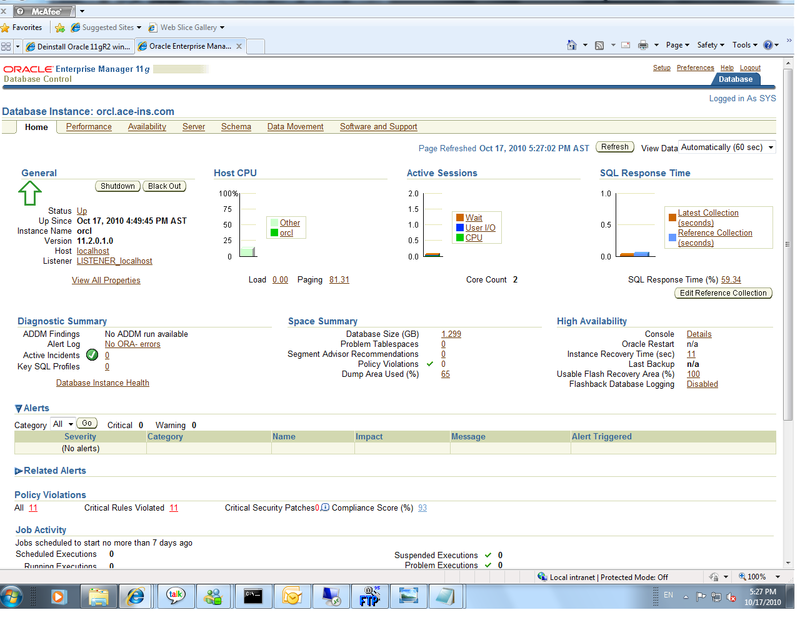 04/03/2010 05:29 AM <DIR> ..
After installed, DB console create successful. Somebody thinking This is simple one How do we deinstall Oracle Software. Then Why this post need? Yes. the previous release oracle software version like 10g or less than, you can click on Oracle Universal Installer Page and then choose deinstall product and clicked what you want remove, you can easily. 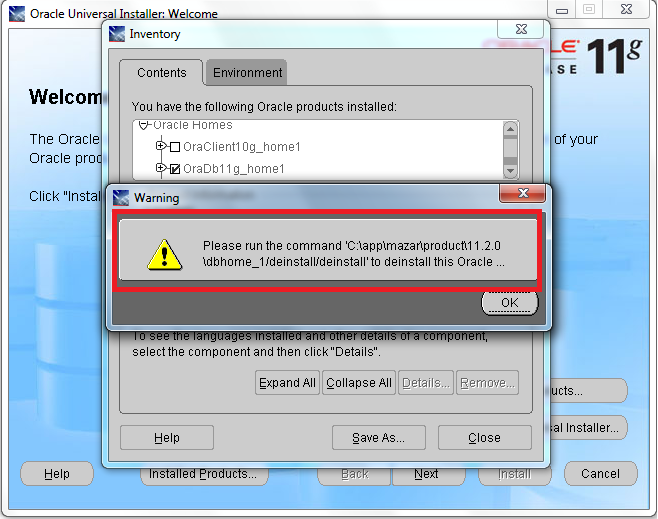 But now you cannot deinstall using Oracle universal Installer, It something different , See below when i try remove Oracle 11g product using OUI. But it showing some permissions issues and also It’s recommand, you should go to download Oracle Deinstall software from OTN. Here it will ask something , you need to give like dbname. Oracle install successfully cleaned up the temporary directories. Now deinstallations Completed, sometimes the services doesnot removed, so you need to remove using REGEDIT.